Tuesday 2 May The Rhône glacier in the Swiss Alps is shrinking due to climate change. Artist Noémie Goudal produced and photographed an installation of the changing landscape for Project Pressure. Glaciers are important indicators for climate change; their sensitivity to temperature changes provides essential information for scientific analysis. Due to its easy accessibility, the Rhône glacier has been closely monitored for 150 years, providing historic observations on the situation in the Swiss Alps. The glacier is a major source of the river Rhône and a primary contributor to Lake Geneva. The ancient glacier is thinning and rapidly disappearing due to climate change. The Rhône glacier has decreased approximately 1,300 metres in length during the last 120 years, including a loss of 6.2 metres in 2015 alone (source: Swiss Glacier Monitoring Network). In an attempt to reduce its melt, the Swiss environment ministry cover it in sheets as a temporary measure. “This installation is the result of a challenge to find not only a concept that links glaciers, melt water and environmental concerns, but also expands on the possibilities of the natural landscape,” says artist Noémie Goudal.The main element of installation included a photo of the glacier printed on to biodegradable, ecologically safe paper. The paper gradually disintegrates adding to the temporary performance of the artwork. The glacier is set at a distance from the Furka Pass. 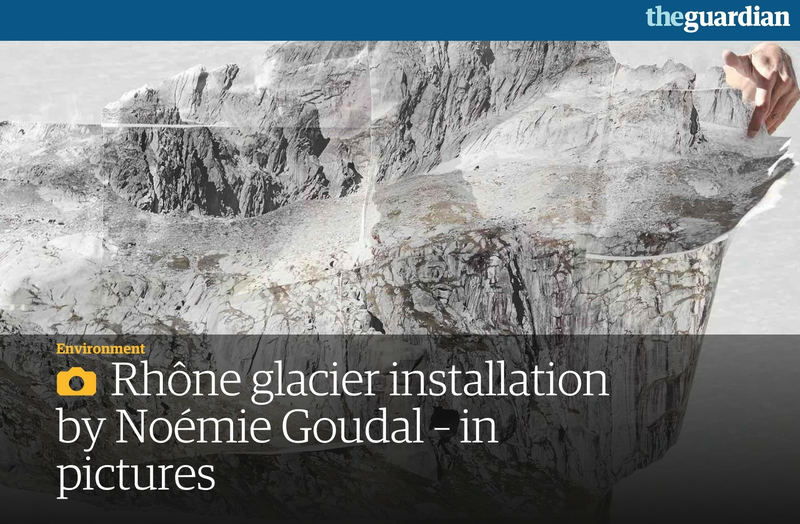 Goudal photographed the glacier with a Hasselblad digital camera to create the initial elements of her work. When building the installation, the team could hear the glacier cracking. Although they were unable to see any changes, the sounds are a constant reminder that this is a moving landscape. The glacier run-off has made a lake that leads to an immense waterfall at the glacier mouth. For Goudal it depicted the transformation from solid to fluid that she had never seen in the natural world before. The international team comprised of volunteers, including local residents and business owners who recognised how climate change is affecting the local area. The project was sponsored by Norse Projects. Local assistance was provided by Till Stoll of Green destinations and accommodation was provided by Sporthotel Oberwald.